Incorporating blues, country, folk, and indie all into one well-made package, Amerika is a notable songwriter effort. 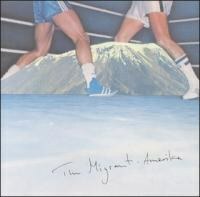 Though The Migrant's Bjarke Bendtsen hails from Denmark, the sounds of Amerika are indebted instead to the album title. The album's rustic sound is highly evocative of either an indie songwriter softly strumming quirky songs in a coffee shop, or a Bon Iver-like songwriter retreating to the rural mountains with only trees as an audience, perhaps even both. Either way, Bendsten sells it. He's great at his craft, and his earnestness is never in question. In general, the songs are primarily dominated by Bendsten's vocal, which at times recalls Thom Yorke, and acoustic guitar. However, most of the songs build into multi-instrumental climaxes, from the blues/country finale of "It's Alright Heart", to the string-backed "2811 California Street". Even better than these moments are the album's bluesiest tracks, notably, the stomp-heavy "The Hurricane" and the mournful dirge "Why Two?". The album isn't without its flaws, of course. At times its production quality moves away from authentic to under-produced. The low-fi audio quality that pervades the record ends up short-selling songs like "Everywhere You Go", which has a horn-dominated peak that would have been better served with a fuller, richer sound. Still, Amerika has an authentic sound that, while similar to many of the other indie songwriters out there, is unique enough that it stands out amongst the fray.